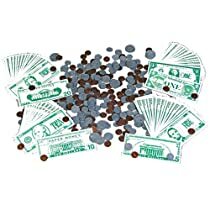 An assortment of 300 paper bills (ones, fives, tens and twenties) and 306 coins (pennies, nickels, dimes, quarters and halves). Over 600 pc. Set. Ages 3 yrs. +.